Ryan Taylor looks to run the floor. The senior guard had 16 points. Coming into Sunday’s game versus Iowa, Northwestern’s offense has been struggling to find its rhythm, averaging 50 points in its last three games. But, the Wildcats’ offense came back to life just in time to face Iowa. 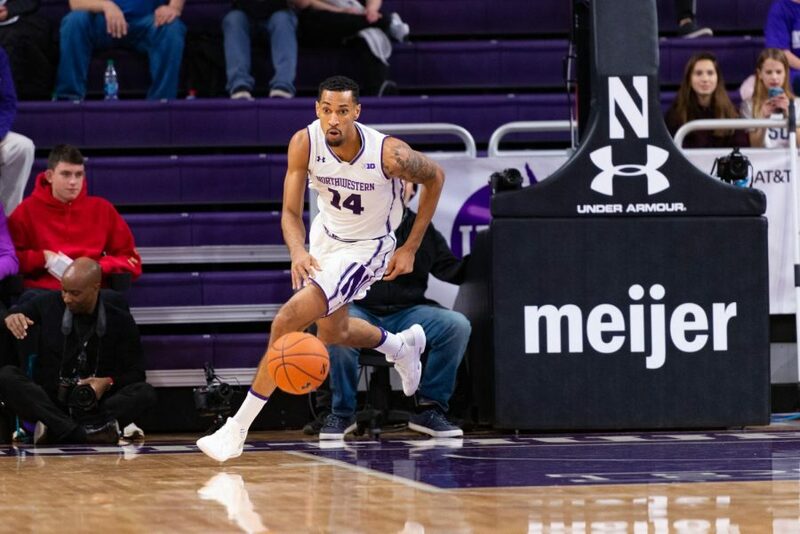 NU (12-11, 3-9 Big Ten) got strong performances from senior Vic Law, graduate transfer Ryan Taylor and junior A.J. Turner, but, in the end, the Hawkeyes’ guard Jordan Bohannon hit a game-winning three point shot to give the the Hawkeyes (19-5, 8-5 Big Ten) a 80-79 victory over the Wildcats. In a back-and-forth affair in the first half, NU and Iowa traded baskets, but Law led the way offensively. In the first half, Law scored 19 of the Wildcats’ first-half points. NU went into the half with a 41-35 lead. In the second half, Law only scored four points, but that wasn’t a problem for the Wildcats. NU was extremely efficient in the second half, shooting 14-26 in the second half. The Hawkeyes hounded the Wildcats with full-court pressure, but NU was able to break the press and convert easy buckets in the paint. With 4:30 remaining, senior Dererk Pardon hit a basket to go ahead by 15. But Iowa went on a 20-6 run to cut the lead to 78-77 with 11 seconds remaining. Law went to the free throw line with a chance to make it a three-point lead. While he made the first, he missed the second, giving Iowa a chance to win the game. Jordan Bohannon hit a three pointer with 0.6 second remaining to sink the Wildcats. 1. Vic Law looks like the the former version of himself. The South Holland, Illinois native came out firing in the first half, scoring 19 points. After starting the season looking like a potential All-Big Ten player, Law has struggled for the second part of the season. But on Sunday, Law finished with 24 points. The senior forward was 5-for-8 on three pointers, the most he has made all season. Law has been struggling with knee tendinitis, which has affected his ability to score, but he looked like a completely different person than what we were used to seeing in Big Ten play. Law was playing like he had fresh legs, finishing a couple of putback dunks while adding a couple of jump shots to lead the team offensively. His rejuvenation on offense led to the rest of the team pulling their weight as well. 2. Ryan Taylor and A.J. Turner helped Law on the perimeter. Senior center Dererk Pardon, who is NU’s second leading scorer, wasn’t effective in the first half. In his place, Taylor and Turner both provided a spark with their shooting. Taylor scored 16 points for the Cats and Turner added 15 points off the bench. During NU’s struggles offensively have been a result of not being able to find a consistent scorer. But in Iowa City on Sunday, all of NU’s shooters were able to contribute. Taylor and Turner were able to come up with timely clutch buckets to help the Cats extend their lead in the second half. 3. NU loses a heartbreaker. After losing to Penn State at home on Monday, the Wildcats’ season was not looking promising. Three straight losses and no offensive consistency, it looked like NU would never figure out its offensive struggles. But Sunday’s performance proved that there is still hope for the rest of the season. The Cats shot 52 percent from the field for the game and 35 percent from the three point line. Law finally looked like himself and his contributions made the whole offense flow. But in the end, the Hawkeyes got a clutch bucket and NU’s admirable performance was cut short by Iowa’s heroics.